I love coffee. So when my brother sent me a Whole Foods gift card for my birthday, I lept at the opportunity to try out several cold brew coffees – a purchase I would normally consider to be extravagant. 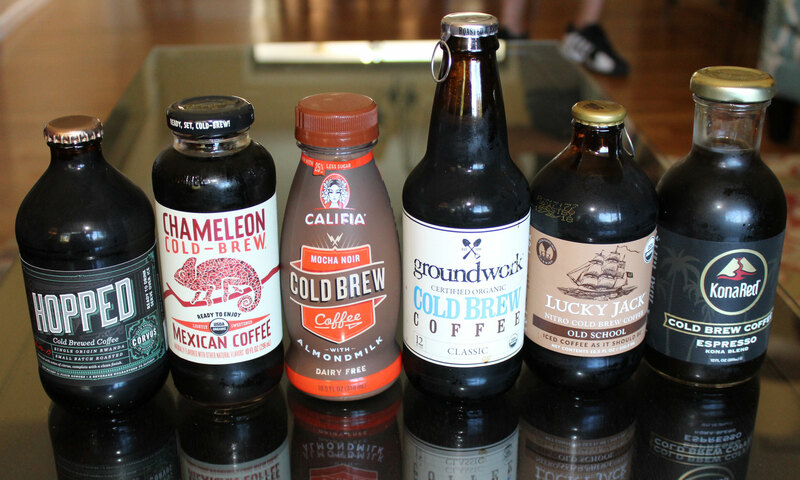 Cold brew is a different process than normal hot-brew coffee. “Cold” refers to how the coffee grounds steep during a long period of time via pressure and cold water – not using the typical just-below-boiling hot water. And to be consistent in applying coldness to the whole experience, I drank each of these coffees in a clear glass over ice. I generally enjoy coffee black with no sugar, please. If I’m at Starbucks, I’ll add half-and-half to my cup, along with one packet of unbleached sugar. Taste is a personal thing, and it varies for everyone depending on your mood. For example, if my drink is dessert, I will choose a different coffee than what I want first thing in the morning (dark with no sugar). For the sake of this comparison test, I drank each coffee without any additions except for ice. And the order below is in the sequence of my testing. I drank one per morning until they were all gone. As much as I want to like cold coffee, i just don’t! I have issues with food texture and am not adventurous at all. In my simple brain, coffee = hot. Don’t even like it as a flavor (ie ice cream). I’m also a cream, no sugar fan. Loved the review though! Drink up! I understand, Chris… but I’m immune to your temp issues with coffee – I drink it hot, warm, tepid and cold.